Born in 1945 Penny lived and raised a family in the Home Counties before moving to Herefordshire, where she now resides and paints in the old market town of Leominster, close to the Welsh Marches. “Paint, especially oil paint, how it moves, what happens to it, the colour and smell, fill my working day. 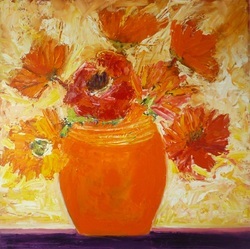 Each painting is a mix of stark line, vibrant colour and heavy impasto. Flowers, landscapes, boats have a tentative start, move through muddled times, before appearing at last the work I wish it to be.